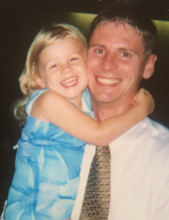 David Michael Grosschedl, 48 of Land O’ Lakes, Florida passed away April 2, 2019 surrounded by his loving family after a courageous battle with cancer. He was born in Toledo, Ohio and graduated from St. John’s Jesuit with the class of ’89. His career was spent in retail management. In 2006 David moved with his family to Land O’ Lakes, FL. He enjoyed fishing, was an avid beer drinker and sports fanatic. He played fantasy football and always supported the Tampa Bay teams including the Lightning, Rays and Bucs. David was an 80’s and 90’s Rock enthusiast and enjoyed attending rock concerts with his daughter Brenna. He also loved spending time with friends and family. David is preceded in death by grandparents, August and Helen Lazur, and Andrew Grosschedl. He is survived by daughter, Brenna Grosschedl; parents, Gean and Linda Grosschedl; brothers, Matthew Grosschedl and his wife Michelle Beaton, Daniel Grosschedl and his wife Kristen; grandmother, Jeanne Grosschedl; and nieces and nephews, Liam, Maeve, Rielly, and Drew. The family wants to give a special thanks to the staff, nurses, and doctors at Moffitt Cancer Center with an extra thanks going out to the Third Floor North Tower staff and to Tami Gerity. Donations in David’s memory can be made to Moffitt Cancer Center at www.moffitt.org/give/waysto-give, by calling 1-800-456-3434 ext. 1403, or sending to Moffitt Cancer Center Foundation 12902 Magnolia Drive MBC-FOUND Tampa, FL 33612. Donations can also be made to St. Michael’s Byzantine Catholic Church in Oregon, Ohio. To send flowers or a remembrance gift to the family of David Michael Grosschedl, please visit our Tribute Store. "Email Address" would like to share the life celebration of David Michael Grosschedl. Click on the "link" to go to share a favorite memory or leave a condolence message for the family.